What is Easter egg? Read and get to know more about easter meaning. Easter is one of the holiest festival of the Christians and it is also celebrated by people of other faiths, sans the religious part. Easter has its roots in ancient time, thousands of years back, connected to resurrection of Jesus. Here we present you with a detailed history of Easter, its celebration in different parts of the world, about the great resurrection and more. Scroll down, and discover known and unknown facts. Easter is a festival of overwhelming joy. The joy that celebrates life. Or, rather, the victory of life over death. But does it have any historic background. Did life really overcame death? Most important, why Jesus is so remembered on Easter? And why those funny stuffs like eggs, and bunnies came to be mixed up with those ideas? Also who brought all those customs on the soil of America? An insight on how Easter came to be observed right from its origin. Throwing a light on its celebrations since the 2nd century, it recollects how emperor Constantine called a council meeting to fixate on the date of Easter Easter has also been attacked as a pagan festival. We have some good reference material on credibility of the notion. Easter did not gain popularity in America till the civil war, owing to the large influence of the protestant church. A short note on how it gained popularity. 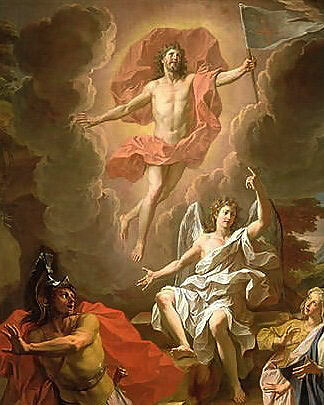 The crux of Easter is the resurrection of Jesus Christ, from His tomb. The lucid narration with enthrall you, and we encourage you to share the story with your kids, and in social networks. Easter today, is more global than you think, and it ranks high in popularity, right after Christmas, Diwali and Valentine's day. Check out its advent in Australia, Africa Mexico and Europe. Easter week is the holiest week for Christians, and each day of this week is special. It starts with Palm Sunday and ends with Easter Sunday. The holy period of Lent covers it all. Check out the lovely scriptures relating the these special 8 days. Share it with your friends too. History and Origin Of Easter Icons ! Easter comes with a host of icons, most of which we are not aware of. Even if we are aware, we may not know their complete implication. Know about the bunny, the eggs and the lily, and why they are associated with this observance. 2> A comment by the Venerable Bede (673-735), an English monk who wrote the first history of Christianity in England. A detailed analysis in this regard, establishing the Christinity of the festival, has been done by ChristianHistory.net.